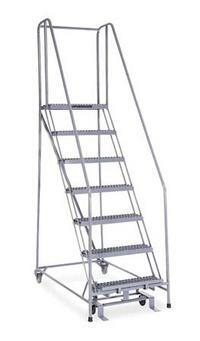 Series 1500 steel safety ladders are shipped knocked-down (assembly time 20-30 min.) in major welded sub assemblies to save on freight charges. 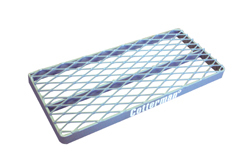 Cotterman's exclusive knocked-down design incorporating diagonal braces bolted together with heavy duty hardware gives an unusually rigid structure that is easly assembled. All tube members are large 1" O.D. smooth steel tubing. Climbing angles are 59 degrees. Steps are 7" deep of durable self-cleaning expanded metal. Top Platform steps are 10", 20" or 30" deep. Grey power coat is the standard finish. Beige, dark brown, yellow, black, green, blue, red, white, orange and light grey are optional. All Series 1500 ladders meet or exceed OSHA 1910.29, ANSI A14.7 standards with a 450 lb. load rating. 3 and 4 step ladders are equipped with spring loaded 2" ball bearing swivel casters. Casters Retract when weight is applied. 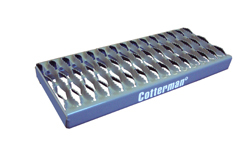 13-16 Step Ladders are equipped with the Cotterman heavy duty Safe-Lock. The expanded metal platform is 10" deep with 42" high guardrails with midrails.